Four times a year I participate in a postcard exchange organized by Amy Souza of Spark. The latest exchange took place during the month of April. Each participant signs on to create an original piece of art on a postcard. Since I'm primarily a writer, I put together original short poems with illustrations. There is never a theme assigned, however, I like working from a theme and generally assign one to myself. This past exchange I used "daisy" as my theme since the daisy, a universally recognized flower, is the official flower for April. I suppose I could have used the official gemstone, but that would be "diamond" and diamond is actually a turn-off as far as I'm concerned! I did a minimum amount of research on daisies (not much more than Wikipedia and this article), but it was enough to get me started. The things that resonated with me I incorporated into the work, for instance, daisy is a symbol of innocence and purity. I decided to write cherita since I believe I have finally found my true form. All the illustrations/photos are in the public domain and I altered and combined them. Brenda at Friendly Fairy Tales is hosting the Poetry Friday Round-Up today. As for me, I'm taking off to attend the first day of the Mass Poetry Festival in Salem! Yay! 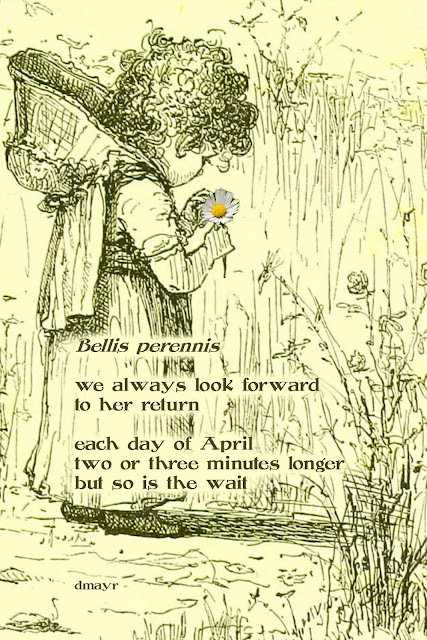 Lovely cherita's Diane, I love the first one – the image echoes the warmth in your poem! Enjoy the Poetry Festival, thanks! You have mastered the cherita form. This poems are lovely. I have been buying daisies for my kitchen table all spring. I like the information you incorporated, Diane, like "the day's eye/opens wide and bright." "Bone flower" sent me off on an Internet journey to find out why! How interesting that "bellis" may be from the Latin word for "war" because it was used as an astringent on wounds. 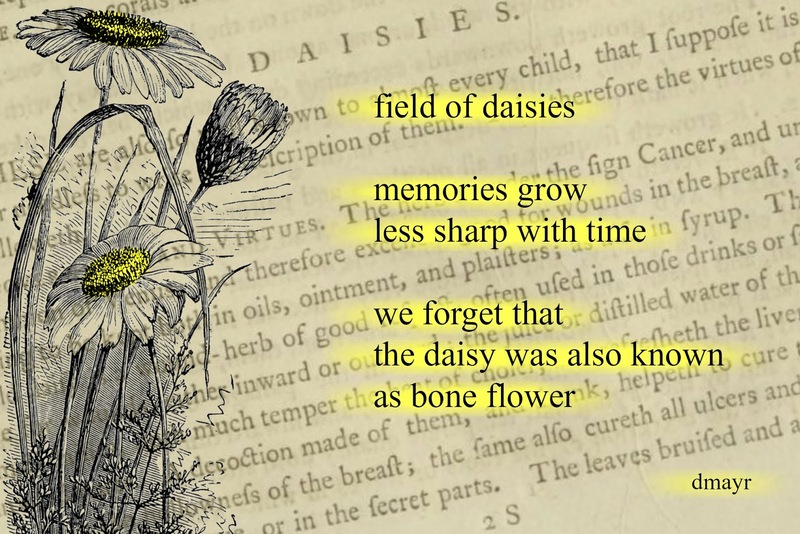 Your daisy poems made me smile today. So uplifting. Fab job with the postcards!! Like Tabatha, I want to know more about bone flower! I really like your postcards, though I'm going to go away and research why... bone flowers?! Diane, I like the digital format of all three of your cheritas so why not wrap them up and send them my way for the Sense-sational Spring Gallery of Artistic Expressions. I am alway happy to showcase your work. 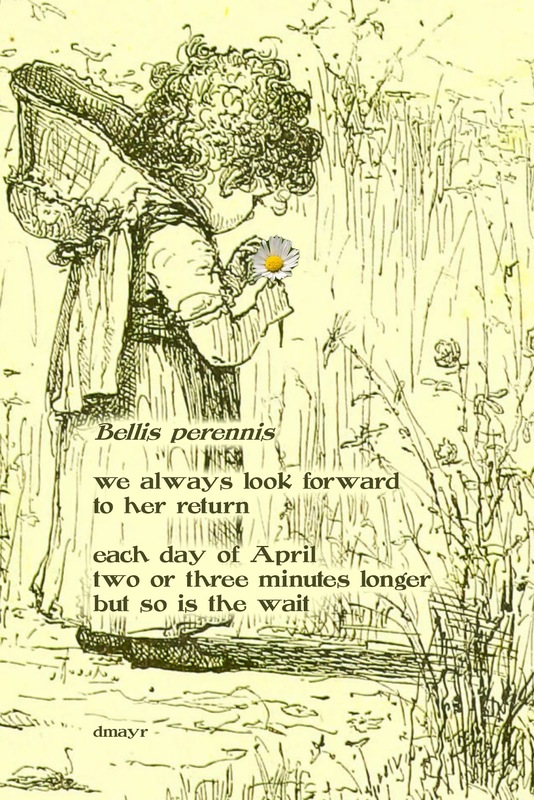 The last image poem is precious and looks like it came straight from one of my antique books of children's poems. I had daisies in my wedding bouquet. :0) These are terrific, Diane - always enjoy seeing what your yearly "sparks" produce. Have a wonderful time in Salem! I love these cheritas, Diane, and your images are the perfect accompaniment. I think the first is my favorite, but I'd be hard pressed to commit to that, as they're all delightful! These are lovely, Diane. So beautiful. These are all beautiful - and so very different! I love how diverse they are! My bridesmaids carried daisies. Two years ago my son put daisies in a flowerbed near a walkway. Last summer they were stunning... and I noticed an unusual number of flies and an unpleasant odor. A little research and I learned that daisies are pollinated by flies and have the unpleasant odor to attract them. I still love daises and they are still in my flowerbed... and I think your daisy cheritas are wonderful. Love the vision of those daisies. :) So beautiful.